For many business executives, travel has become a common element of everyday working life. Globalization has seen larger organizations develop an International presence, with offices located worldwide. Whether taking a domestic or overseas flight to visit another office or customer, taking time out of work to travel is often considered an inefficient use of time and resources. In September of 2009, Allied Gold appointed Pactel International to design a solution that could provide high speed data services between their Brisbane data centers and their remote Simberi mine in Papua New Guinea. The new platform had to replace an existing, lower bandwidth communication system and had to be cost-effective, while being robust enough to withstand the extreme weather conditions and harsh environment of New Guinea. Having joined Spacecom in 2009, Eyal Copitt leads African sales for the Company. Mr. Copitt possesses more than 20 years of worldwide consulting and sales experience, of which 15 are in the African IT and Communications Markets working with governments, private and national owned Telcos, the finance industry, and education networks. Prior to joining Spacecom, Mr. Copitt served as the Vice President of Sales, Africa, at Gilat Satcom and as the Africa District Manager for NetApp, where he was in charge of developing new markets in the African Markets. Nigel Gibson is Vice President International Sales for Telesat, where he is responsible for expanding use and revenue on the Companys international fleet. These satellites include: Telstar 11N and Telstar 12 which mainly serve the Americas and EMEA regions, Anik F1 and Telstar 14R that serve the Americas, and Telstar 18 over Asia. A new satellite to be launched in the second half of 2012, Anik G1, is now under construction by Space Systems/Loral and will offer coverage of both North and South America. SES used the giant IBC broadcasting technology show to unveil its new look philosophy and logo and to flag up the fact that the Company was now carrying 6,000 TV and radio channels across its satellite fleet, with more than 2,400 being transmitted over Europe. SES is claiming the worlds top spot for HDTV channels, with 1,071 now on air around the globe. (216 over Europe). State and local officials from across the Amazon region of Brazil converged on the city of Manaus this fall to commemorate a milestone agreement between O3b Networks and Ozonio aimed at delivering connectivity to the underserved region. Satellite technology plays the single most important role in delivering connectivity to rural and remote village and enterprise communities throughout Africa. The vision of a ubiquitous fiber infrastructure across Africa is a noble but unrealistic aspiration. As such, VSAT deployments will continue to form the basis for rural connectivity for the foreseeable future because they deliver the only affordable, cost-effective and reliable means to reach the parts that other transmission technologies cannot. Since its inception in 1996, Asia Broadcast Satellite (ABS) has grown from a single-satellite operator to operating a fleet of satellites that include ABS-1 (flagship), ABS-1A, ABS-7, ABS-3 (scheduled for operations December 2011) and ABS-2 (under construction and scheduled for launch 1H 2013). Insight: Goonhilly  Yesterday, Today + Tomorrow, by Bob Gough, Managing Director, Carrick Communications Ltd. The maritime industry, like many others, is undergoing perpetual change. As we know, shipping companies have been impacted as much as any by macro-economic factors such as the recent financial crisis, while more industry-specific developments such as the increasing importance of crew retention have also brought about significant change. These are extremely challenging times for those seeking new careers, whether by choice or not by choice, today companies economics compel them to re-assess their staffing needs. The bad news is that qualified professionals are finding themselves suddenly faced with the need to seek new positions... the good news is that the satellite communications industry remains ripe with new opportunities. Finding such opportunities can sometimes be a rather difficult proposition. Data is not just a buzzword. Its a global business phenomenon thats rapidly escalating into multi-billion dollar revenues for the communications industry. Broadband connectivity for all is top of the agenda for leading telecom organizations and governments around the world. Short-term forecasts dictate that certain Middle Eastern countries are set to overtake Western Europe in Long Term Evolution (LTE) 4G wireless broadband technology penetration. However, despite accelerated efforts in the Middle East to ease accessibility to broadband services, available networks are still behind the curve when it comes to addressing market needs. As a result, in many areas, broadband penetration remains quite low, particularly in remote areas located outside of urban centers. A member of the World Teleport Association, Europe Media Port (EMP) was ranked first in revenue growth globally by the World Teleport Association during 2009 and 2010 and is a global provider of transmission services via satellite, fiber and transit IP. EMP delivers the highest quality transmissions of video, data and Internet to broadcasters, enterprises, ISP providers, teleports, satellite operators and governments. Satellite-based connectivity is a crucial and fundamental need for ongoing communications throughout Africa. 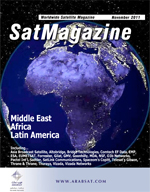 This year, Gilat Satellite Networks has continued to expand and enhance its customer base and network deployments throughout the region, supplying service providers, operators, enterprises and governments with satellite communication solutions based on industry leading VSAT (Very Small Aperture Terminal) solutions. As a leading provider of global satellite transmission services, SatLink Communications emphasizes global content distribution for television, radio and data channels over satellite, fiber and IP to every corner of the world. For the MENA market, the Companys strategic location at the southeastern end of the Mediterranean Basin provides great flexibility to serve this crucial market. Digital media operations are the wild frontier. With the hybrid of technologies involved in delivering media to the TV-anywhere audience, and the continual rapid evolution of platforms, formats and business models, theres little chance that any digital media operation will stand still for long. Predicting the future is a very uncertain science. Nevertheless, in the satellite business, the trend for ever-increasing capacity, flexibility and availability of service, as well as increasingly more affordable, more compact, lighter, and even more stylish and ergonomic ground and personal terminals, has become a clear reality of this communications market segment. There is no reason to believe that these trends towards perpetual improvement will change markedly in the future, and that competitive pressures to achieve these objectives earlier and for a lower price will ever disappear. Moreover, the initial conceptualization and design phases of future missions tend to start many years before the issuance of the first associated Requests for Proposal (RFP), and therefore they provide a rather reliable and solidly based window into the future of the business and of the technology.